Here is the division I'd expect there to be. Here is how I suggest we equip as soon as we can our Fyrdmen. I'll supply pictures to help with the endeavour. Post your ideas for the Layout of our Fyrdmen. I would suggest leather gloves for the hands just for the grip they give. 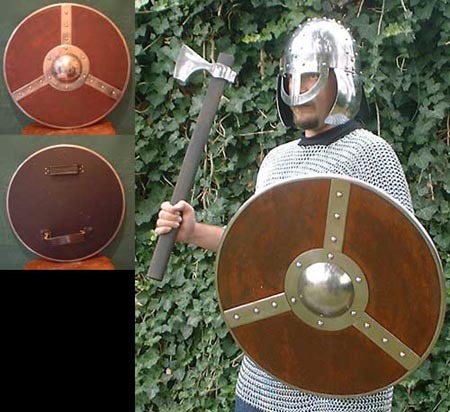 Also a larger square shield might be better than a small round one just because it gives more protection and shields better to arrows. A large boxy tower shield is slow and cumbersome, Fyrdmen are designed to be quick, hitting flanks, long distance engagements (I.E lots of running around), they are Militia, not designed to be in the front taking the Brunt of the fighting, they are the Hammer in our Anvils. Imagine him with a Gamberson then you'll have a Fyrdman. Anyone else have any suggestions on the kit layout of Fyrdmen?